This page contains the Pokedex Data for Trubbish, including base stats, type defenses, abilities, evolutions, move list and location in the games. 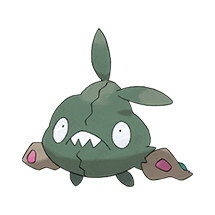 Stench If the Pokémon make physical contact with the opponent, there is a chance the opponent flinches. Sticky Hold This Pokémon’s item cannot be taken. Aftermath The foe that dealt the final hit loses 1/4 of its maximum HP if the move made physical contact.